Nestled in the center of Denmark's garden island, Funen, which is packed full of magnificent manor houses and palaces, Odense is named after the Norse God of war, wisdom, and poetry, Odin. This culture-rich town is also the birthplace of that most famous Dane and teller of fairy tales, Hans Christian Andersen. It's not surprising Andersen took to his craft as he did, for this is a magical land with no shortage of literary inspiration. The excellent Hans Christian Andersen Museum will take you into the world of his imagination. That and his childhood home should be high up on your list of must-see attractions. The city is easily reached from Copenhagen, either a drive of less than two hours, or direct train through magnificent unspoilt countryside. Less than 30 minutes' drive from Odense is the fairy tale Egeskov Castle, the best preserved moat-castle in Europe. The current structure was built by Frands Brockenhuus and completed in 1554. This superb Renaissance building, which looks so peaceful and idyllic now, was built for defence against attack. It consists of two long houses connected by a thick double wall so wide that contained within it are hidden stairs and a well to secure a water supply during a siege. Over the centuries, the castle has changed hands many times and later became a model farm. The grounds opened to the public in 1959 and since then, much renovation has taken place. A Veteran Car Museum opened here in 1967, and other tourist attractions include a treetop walk and Segway tours. The Banqueting Hall is magnificent, and the setting of this beautiful castle is breathtaking. From Egeskov Castle, you can travel 15 kilometers to Svendborg and board a ferry to the picturesque island of Aero with its quaint cottages and cobbled lanes. Dating from 1908 and dedicated to the writer's life and work, the Hans Christian Andersen Museum explores Andersen's world through artifacts, mementos, and exhibits. Of particular interest are his drawings and artwork. The interactive installations include a PC that allows you to leaf through his books. At the listening posts you can hear his wealth of stories and poems. The museum shop has a wide selection of books in several languages, both about and by Hans Christian Andersen. The domed hall is adorned with scenes from the autobiographical book Story of My Life. To the southwest of Odense Cathedral, in Munkemøllestræde (3-5), you'll find Hans Christian Andersen's childhood home (Andersen's Barndomshjem) with a memorial plaque on the gable end. Andersen lived here from 1807-1819. The building is now a branch of the main museum. Less than 3.5 kilometers from the city center is the charming Funen Open-Air Village, a great day trip and ideal way to explore the rural Denmark of the past. Billing itself as "a village from the time of Hans Christian Andersen," buildings such as workers cottages, farmhouses, and shops have been brought here to create a historic "living village." During summer months, guides in period costume take visitors through the grounds and demonstrate artisan skills, crafts, and cookery. You can even take part, and children, in particular, will have a great time. There are various old breeds of farm animals, and from July-August, outdoor theater for all the family. A little under 1.5 kilometers from Odense Cathedral is the wonderful Railway Museum with an eclectic collection of 19th century locomotives. Here, you can relive the glorious days of steam trains right through to more modern diesel trains. Originally constructed as an engine workshop for DSB and the private North Funen Railway Company, the roundhouse is now an impressive exhibition space where you can experience the history of Danish railways. Aside from the impressive and comprehensive permanent collection, which includes double-decker carriages and a Royal Saloon Car, there are regular visiting locomotives, including Thomas the Tank Engine, and the chance to take a ride on a vintage steam train. In the city's west, a leisurely ten-minute stroll from the cathedral is Brandts Art Hall (Brðndts Klædefabrik), a former textile factory which is now an Arts Center, with shops, restaurants, and cafés. The Art Hall itself is an exhibition covering an area of 1,600 square meters. In rooms, which once housed spinning-jennies and looms, are stunning paintings, sculptures, and a range of works from the fields of architecture, design, and handicrafts. The new Collection Wing holds more than 15,000 classic works of art and photographic exhibits by world-famous photographers. In addition to all this, there are regular video installations, concerts, and public lectures. Odense town center, around the cathedral and Town Hall, is a pleasant pedestrian zone where outdoor markets often take place. In Flakhaven, a square bordering the long street known as Vestergade, you'll find the Town Hall, the oldest part of which was built in red brick in the late 19th century and modeled on an Italian-Gothic style. Further enhancement of the building took place between 1936 and 1955. The hall contains many works of art, including the sculpture, Spring in Funen. If visiting during the summer months, there are regular free concerts at Flakhaven and an annual flower festival. To the south of Odense Town Hall, you'll find St. Knud's Cathedral (Skt. Knuds Kirke). It's named after the Danish saint, Knud IV, who began building the structure around 1100. The original church was burned down in the 12th century, and after a further great fire, a three-aisled replacement was started in the 1300s. In fact, it took almost 200 years to complete. A notable feature of the interior is the crypt below the choir, which contains the tombs of King Knud, his brother Benedict, and various other kings and their consorts. Behind the High Altar stands a huge reredos with magnificent carvings. Other points of interest are the epitaphs, the bronze font of 1620, and the pulpit dating from 1750. To the east of the cathedral, a park named after Hans Christian Andersen (H.C. Andersen Haven) complete with a statue of the writer stretches along the waterfront. Voted one of best small zoos in Europe, Odense Zoo has a wide variety of unique attractions and is an easy 3.5-kilometer drive from the city. Here, you can get up-close with giraffes, watch tigers and lions, and see other animals being fed. In summer, you can even camp out for the night in the grounds (minimum 4 people) and get a behind-the-scenes guided tour. Also during peak season, there are hourly boat trips to the zoo from Munke Mose Park. Among the impressive variety of species are penguins, zebras, ostriches, and chimpanzees. Children will love communing with all the furry and feathered friends. A two-minute walk from Flakhaven is the Møntergården Museum. This is the Old Mint dating from 1646, which now serves as a Museum of local and cultural history. 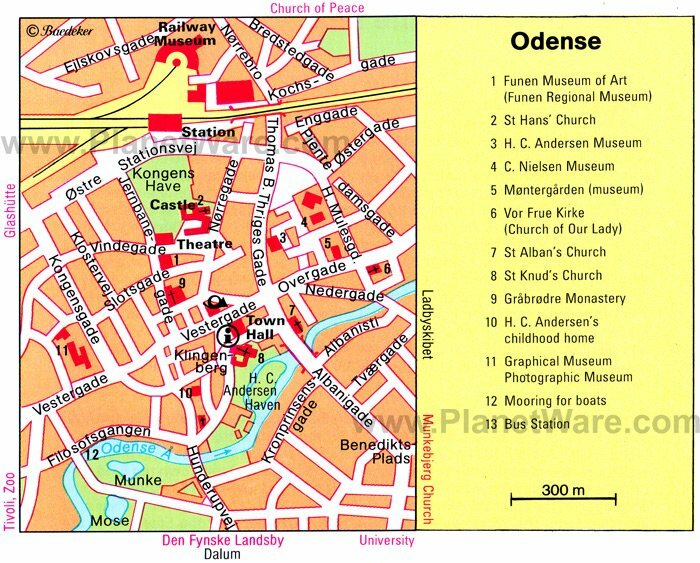 The complex includes typical houses of old Odense from the 16th and 17th centuries as well as a Baroque warehouse. The buildings are furnished with interiors of various periods, and there are collections of local costumes, ceramics, ecclesiastical art, toys, silver, clocks, and coins. The "Odense in the Middle Ages" exhibition is particularly interesting. In 2013, a new building housing the exhibition, "Funen - Center of the Universe" opened. For a little light relaxation, or maybe a picnic after all the sightseeing, consider a visit to Munke Mose Park, which has peddle boats for hire during summer. This was once part of a factory grounds (Monks Mill), but was bought by the municipality in 1881 and eventually turned into a pleasant waterside recreation space. There's a very popular playground, and in peak season, boats to the zoo. Various festivals and celebrations take place in the park throughout the year. First Hotel Grand: 4-star classic hotel, fantastic location, 19th-century red-brick building, bold room decor. Radisson Blu H.C. Andersen Hotel, Odense: mid-range pricing, central location, great breakfast buffet, modern decor. Ansgarhus Motel: affordable B&B, welcoming owner, sparkling clean rooms, great breakfast. Alberte Bed and Breakfast: budget-friendly B&B, near supermarkets and public transport, quiet neighborhood, clean rooms.